NEWPORT NEWS, Va., Nov. 19, 2007 (PRIME NEWSWIRE) -- Northrop Grumman (NYSE:NOC) Foundation launched more than 40 Virginia teachers into weightlessness on Nov. 16 as part of its Weightless Flights of Discovery program. The goal of the program is to inspire the next generation of scientists, mathematicians and engineers -- critical areas where the U.S. has fallen behind globally. Matt Mulherin, senior vice president of programs for Northrop Grumman Newport News sector, spoke to the teachers before they boarded the plane about the decline of engineering graduates in the United States. "This program is specially designed to give you a story," he said. "And if that story inspires your students to study math and science, we have succeeded." Rolf Bartschi, vice president and chief nuclear engineer of waterfront nuclear engineering and test at Northrop Grumman Newport News, shared with the teachers some of the organizations that company employees participate in to increase math and science interest. "All of these programs are very successful, but we need to do more," he said. "We need to be more creative, and that's where weightless flight comes in." 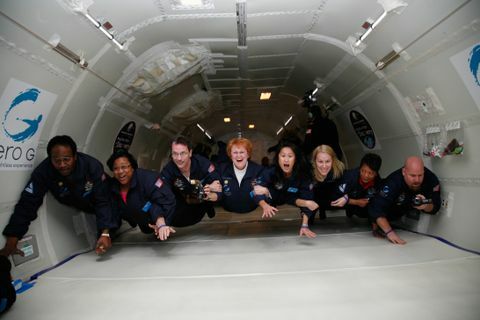 Northrop Grumman Foundation Weightless Flights of Discovery is an innovative hands-on training program that gives teachers an 'out-of-this-world' experience as a way to help them inspire their students to pursue careers in science, technology, engineering and math. Area teachers prepared for the zero-gravity flights this summer by attending workshops and designing experiments to execute while in zero-gravity in order to test Newton's Laws of Motion. Following the flights, the teachers will bring their in-flight experiences, enthusiasm and videotaped experiments into the classroom, where they will be integrated into lesson plans. For more information, visit: http://www.northropgrumman.com/community/weightless.html .